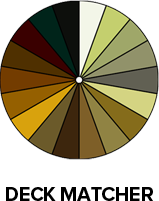 Deck Matcher | Starborn Industries, Inc.
Find the right screw color to match all of the most popular decking products: PVC, composite, hardwood and pressure treated. Colors are labeled according to Starborn's color names along with the two-digit number assigned to each color. (For ordering purposes, this two-digit number is incorporated into all of our item numbers). For more information on selecting the right deck screw, visit the Deck Fastener Information Center.